In my ongoing quest for great additions to the Windows admin’s toolbox, I’ve found and am learning MiniTool Partition Wizard. It’s available in both freeware and commercial forms, for home and commercial use. That’s a nice touch, because users can download and learn the fundamentals of the program for free. Then, for use at work, they can purchase any of a number of licenses for $50 and up (see home page for details). Here then, is the latest entry for the Win10 Admin Toolbox: MiniTool Partition Wizard (MTPW). A function map for MTPW appears on the front page of its built-in help file. 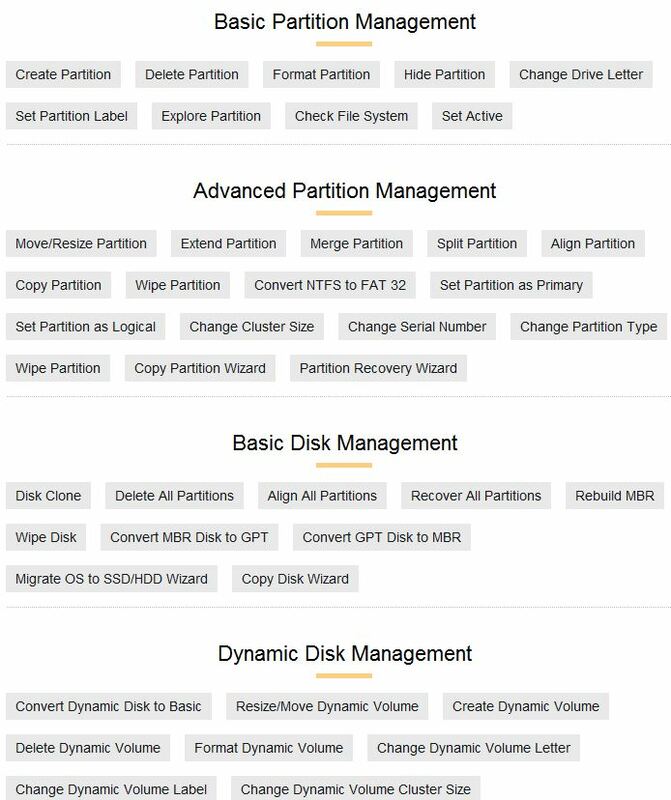 What’s So Good About MiniTool Partition Wizard? Otherwise, you get the whole shebang on a free copy for home/personal use and practice. It’s great at inspecting partitions and then deleting, merging, splitting, or moving them around. For those interested in disk layouts after upgrades, it offers validation that an upgrade is worth following with a clean install. Once a device gets its digital license you can wipe the current drive layout and start over fresh with a clean (or customized) Windows 10 partition scheme. Because Windows 8 used 300 MB and 8.1 350 MB recovery partitions, partitions 2 and 6 map to those OSes. Partition 3 (FAT32) is the EFI partition, 4 (C:) is the OS partition, and 5 is the Windows 10 recovery partition, whose 450 MB size identifies it. That partition is also so labeled in the details information from MTPW. By deleting no-longer used partitions, then moving the other partitions one gains but a scant 650 MB of disk space. Because of the complications involved in moving the EFI partition, and reassigning remaining recovery partition’s location, I’ve simply left it alone. But one can easily see why a clean install that includes a disk wipe makes good sense. For those interested in trying a partition clean-up, MTPW is certainly up to the task. This is a terrific program well worth downloading and learning. If your budget has room for another commercial license, it will also come in handy on the job.